So, I did it again. It was an accident. I don’t know how this keeps happening. 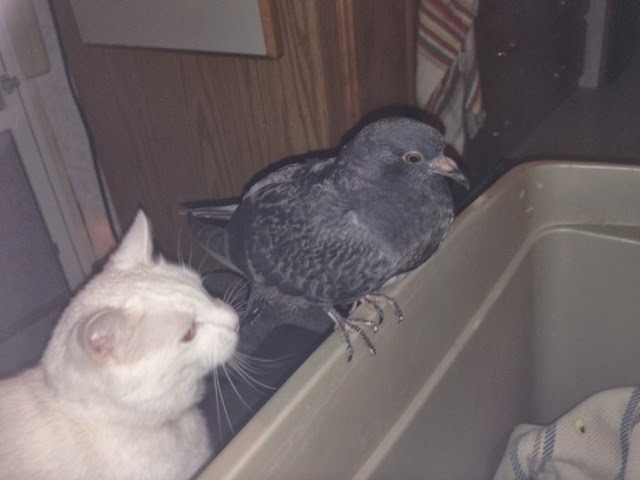 But I brought home an injured pigeon from Hollywood tonight. She was just walking across the street limping and with her wing hanging down. She looked so pathetic. If we didn’t turn around to get her she would have died one way or another for sure. So now she’s in a big bin with my sweatshirt, fresh water, and leftover pizza. And she’s covered up so it’ll stay nice and warm in there tonight. I’m hoping tomorrow she’s better, and I’ll assess what the Hell is wrong with her after she rests. BTW, she tweets and looks around and sits on my hand with no problem. She acts like a tame bird. I videotaped it because it seemed so odd that she just trusts me to pick her up and hold her, and she roosts on my arm like she’s tame. Weird. Look how (Ugly) she is.